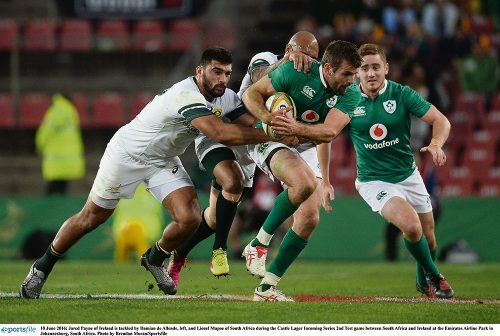 Ireland led 26-10 going into the final quarter of their game with the Springboks last Saturday and an unprecedented series victory beckoned, when South Africa stepped up their efforts and pulled off an unlikely win. Playing at altitude in Johannesburg was always going to be a challenge for the Irish but their first half dominance of proceedings created the belief that victory could be theirs. During the first half Paddy Jackson resumed where he left off the previous week, controlling the game with astute use of the ball. He exploited all the vulnerability of the Springbok defence under a barrage of high kicks which yielded much fruit. Ireland dominated with little come back from South Africa. Springbok Coach Allister Coetzee was a worried man as he left the field to boos and cat-calls at the interval. His response was to introduce a game-changing bench to the action. Right wing Combrinck made an immediate impact, bursting through tired tackles for a fine try. But even then Ireland resumed their advantage when Jamie Heaslip somehow managed to hang onto the ball for a try in the corner which Jackson converted. However the signs of weariness in Irish legs were beginning to appear. Schmidt introduced his substitutes and it soon became obvious that Ireland were digging deep into the reserves of their squad. The impact of the changes was as damaging as the Springboks had been beneficial. Jack McGrath, Tadgh Furlong and Rory Best in particular were sorely missed after their departure. 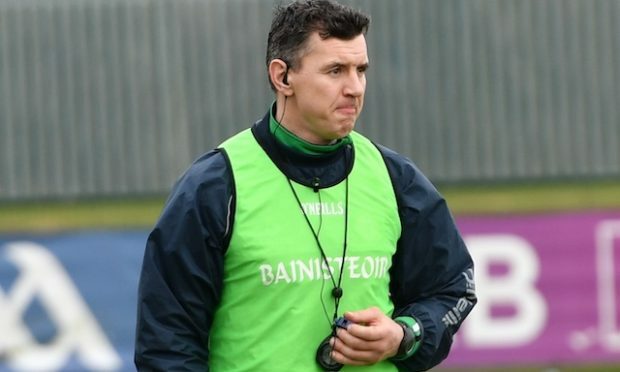 The Irish scrum yielded penalties where it had been robust. 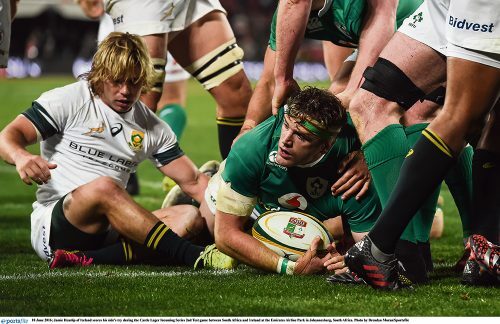 Irish tackles were missed as the Springboks grew in confidence. The crowd who had jeered the home team started to get behind them. In addition to the weakening of the team through substitutions, the Irish players were visibly wilting as the effects of the gruelling altitude conditions took its toll. This week the teams return to sea-level and Ireland will be able to restore their rested players and they have every reason to believe that victory can still be theirs in this competitive series. Mike Ross, CJ Stander, Luke Marshall and Keith Earls will all return to the fray. While South Africa will take confidence from their second-half display, they will be aware of the threat from this Irish team. It promises to be a fascinating battle to conclude the season. It has been a tough season for these Irish players. 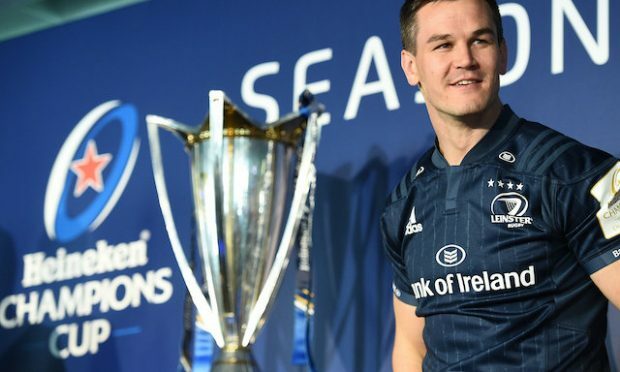 Starting with the disappointment of the World Cup and including the failure of the Irish teams to make the knockout stages of the Champions Cup. However they have an opportunity to finish on a high. None of the home nations have ever won a test series in South Africa. History could be made this week. 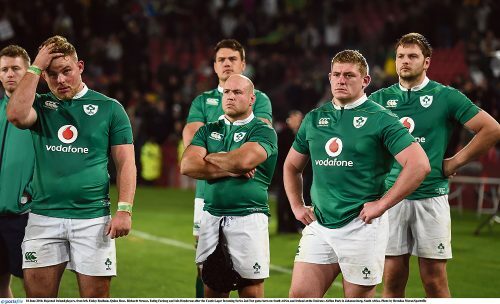 Joe Schmidt will be anxious to encourage his team to put Saturday’s defeat behind them. For much of the game they outplayed the Springboks and with the inclusion of the rested players they have every reason to believe victory can still be theirs.